Gold Loan Yojana - Saraswat Cooperative Bank Ltd. 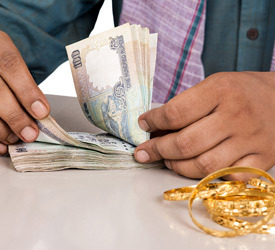 In case of an urgency of any sort of financial needs, fall back on Saraswat Bank’s Gold Loan Yojana to get a loan approved of over Rs. 50 Lakh instantly. Advance can be given to males solely against men ornaments without female applicant. When advance is given only to male applicant against women ornaments, female consent is required to be obtained or she should be made a coborrower. PLR- 3.25 i.e. currently at 11.15% p.a. KYC documents of applicant i.e. latest photograph, Identity proof, residence proof.